Sumac. A strange little word. I assumed it must be Native American—it just sort of sounds like it. And sumac is a dirt-common American plant, lining roadsides, springing up in empty lots, under power lines–all across the country, literally from coast to coast. But when I googled the word sumac, it turns out to be derived from ancient Aramaic, of all things. Sumac doesn’t refer to just the native American varieties, there are hundreds of sumac species all across the world. 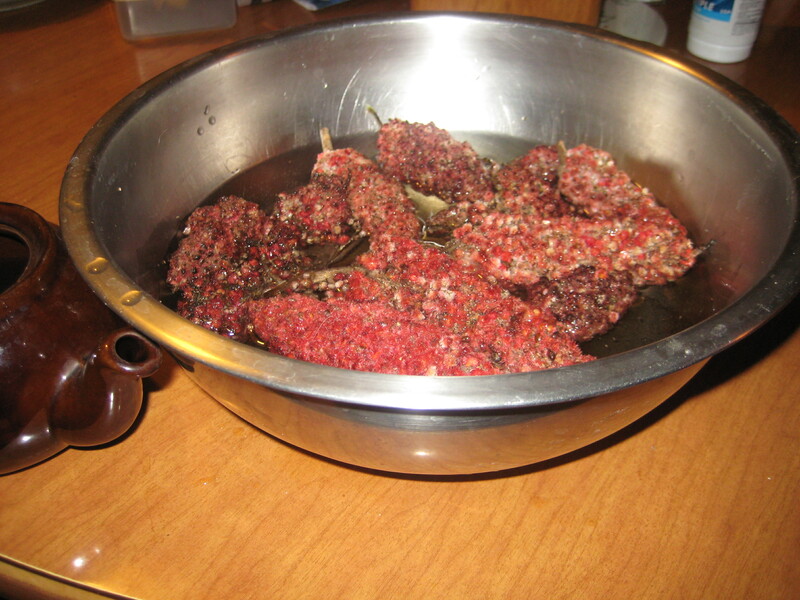 Sumac, it turns out, was a prized spice and also a medicine in the ancient world, a very valuable commodity. In the 1970s, an 11th century shipwreck was discovered off the coast of Rhodes. Archeologists identified the remnants of the cargo: exotic fruits and spices, including pomegranates, apricots, peaches, and sumac. 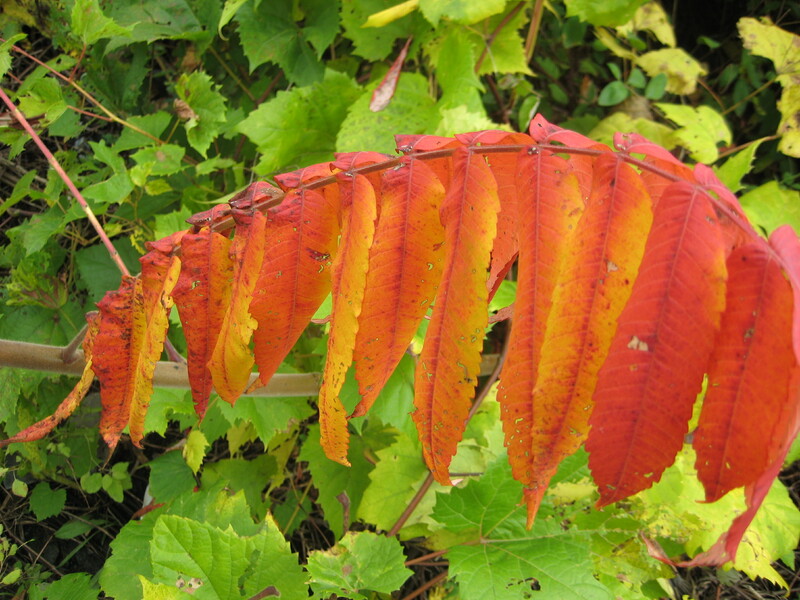 The word sumac, in Aramaic, means deep red. Deep red. What a good name. 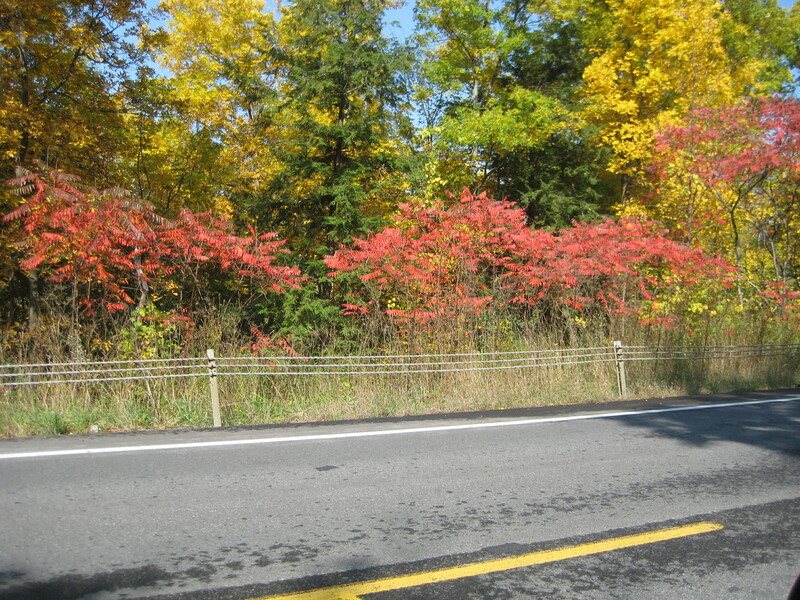 Because sumacs are red indeed, both leaves and fruit, a warm, glowing red that is the very heart of autumn. And the berries make a tea that is for me the taste of autumn—tart, a little bitter, and gorgeously colorful. Now you may be thinking in the back of your mind someplace that the word sumac is often associated with the word poison. 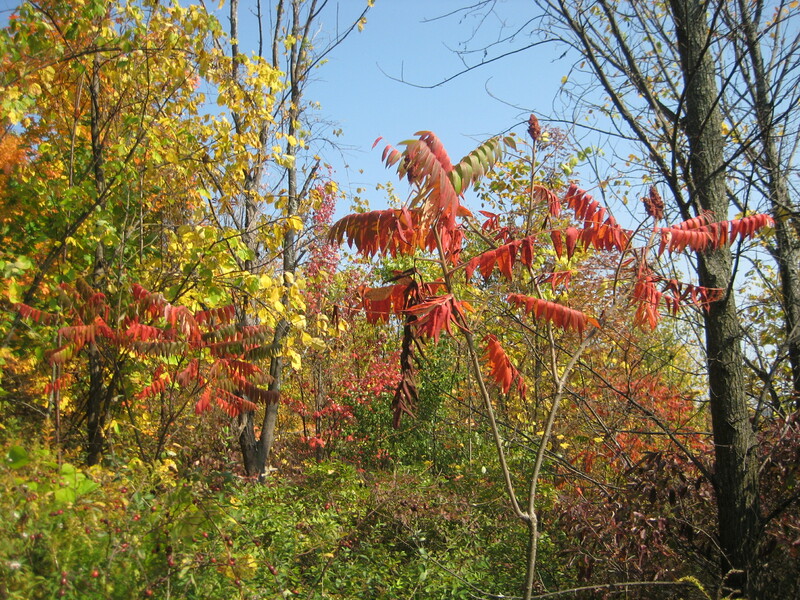 Sumac trees are often cut, sprayed or otherwise ruthlessly eradicated, in the mistaken belief that all sumacs are poison. Not so. All the red-berried sumacs are perfectly safe for humans, and a major winter food for birds. Common (by which I mean non-Latin) names for plants are so confusing. 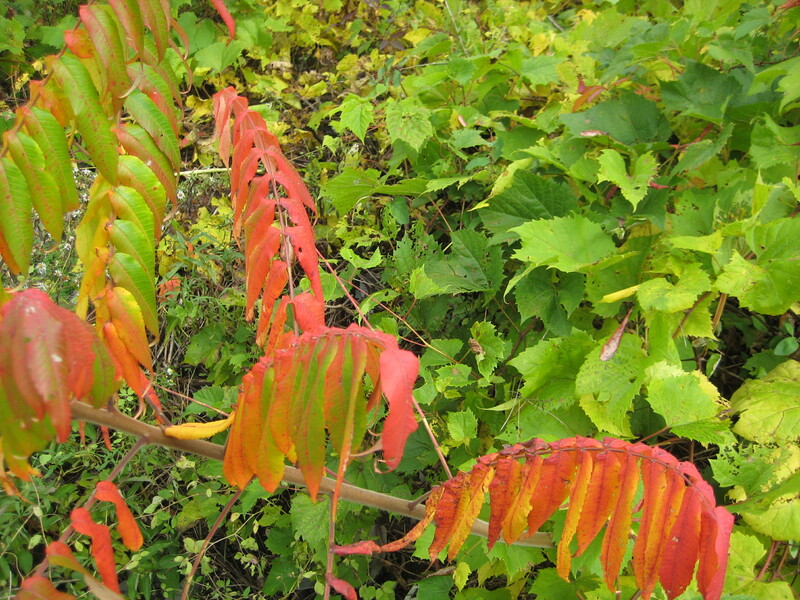 Poison sumac (Toxicodendron vernix) is a completely different and unrelated species, and indeed something to beware of, quite a bit more toxic than poison ivy, in fact. The good news is that it’s much less common than poison ivy, and so you’re less likely to bump into it. Poison sumac, like its cousin poison ivy, has distinctive white berries. Berries white, take fright. 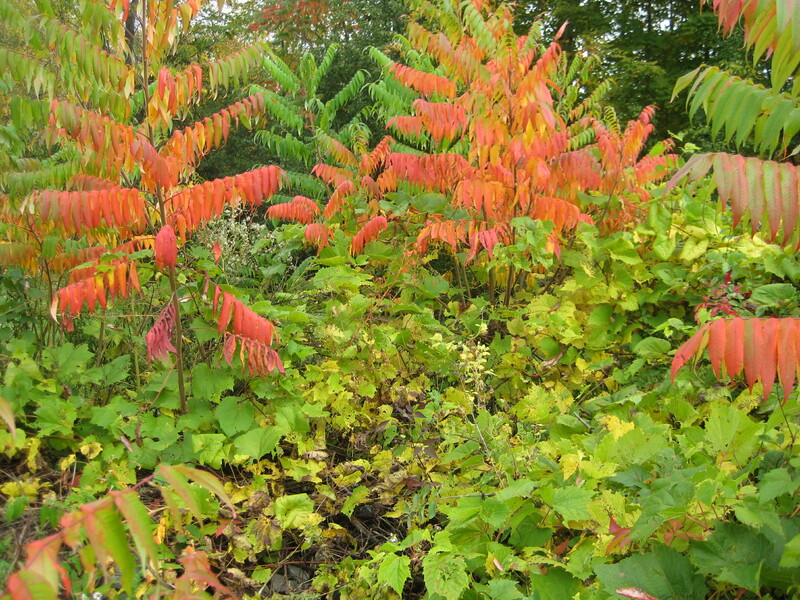 The sumacs I’m talking about (Rhus ssp.) 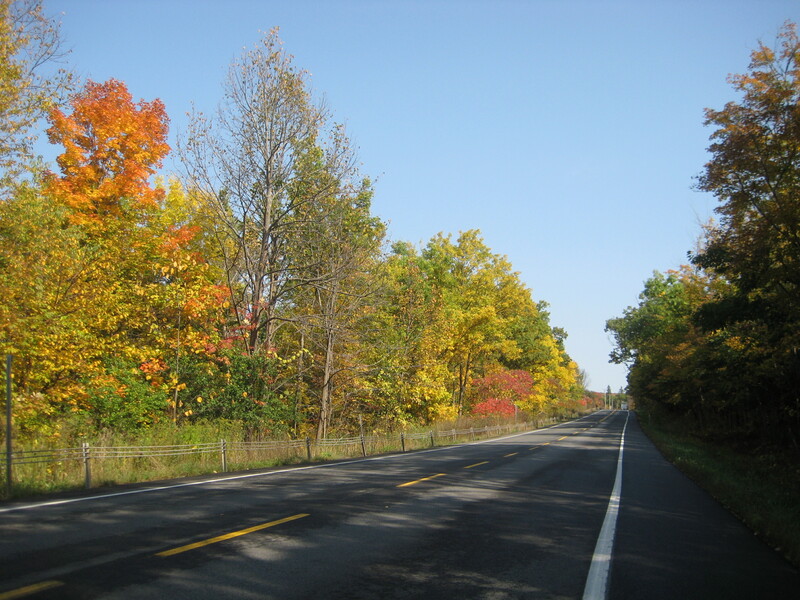 have red leaves in fall, and clusters of small red fruits. Berries red, no need to dread! I almost hate to pick the scarlet clusters, because I don’t want to rob a hungry cardinal or bluebird of possible food on some icy January day. But every fall I make just one batch of sumac tea. I enjoy eating wild plants, as long as someone else cooks them. Cooking is not my strong point. But sumac tea is so easy, even I can do it. Pick the fuzzy cones of red berries, and rinse them off to remove dust and any lurking bugs. Squeeze them (the berry clusters, not the bugs) just slightly to bruise them a bit, then put them in a bowl and cover with cold water. Leave them overnight. The water will turn a rich shade of pink. Strain the liquid, if you’re the sort who’s particular about fuzz or possible insect parts in your tea. (I’m not, myself.) Sumac tea has a pleasantly puckery, lemonade taste. You can taste the vitamin C. But there’s something more, something earthy, rich, a little melancholy about the taste. Maybe it’s just knowing that it’s an ancient flavor, one people have been savoring for millennia of autumns. Maybe it’s the short, doomed beauty of the blood-red leaves. Or maybe it’s just the insect parts.